Bread was a staple food item in the 19th century eaten by all classes of society. White bread has always been the more desirable colour for bread, the whiter and finer the loaf the better the quality. The wealthy members of society ate bread made from whole wheat flour that had been sieved to remove the coarser grains. The desire for white bread was so strong that some bakers artificially whitened their loaves with alum or chalk. 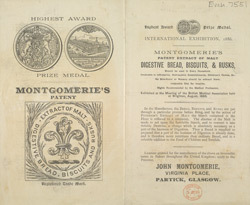 The manufacturer of bread and biscuits featured on this leaflet, Montgomeries, is exhibiting his produce at the International Exhibition of 1886 and proudly states that he won the highest prize medal for his food.